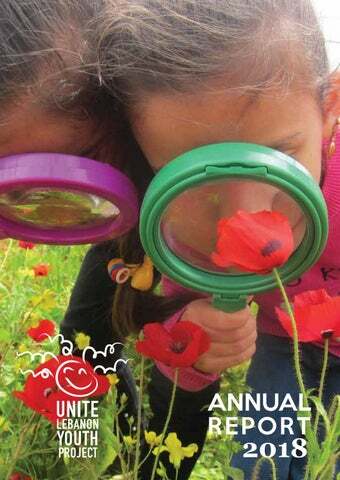 Meet ULYP Unite Lebanon Youth Project (ULYP) is a nonprofit organization (NGO#134) established in 2010 to propel a paradigm shift in Lebanon to a place where people can co-exist, unite and work together for a better future. To instigate this shift, ULYP focuses on education and opens doors that would otherwise remain closed to the underserved and refugee communities in Lebanon, in order to improve their livelihoods, pursue university education, believe in education, and trust in their abilities to become active agents of positive change. Vision A united Lebanon where everyone has equal access to education and the opportunity to realize their full potential. Mission To empower the marginalized children, youth and women of today with the skills and knowledge they need to become active agents of change for a better tomorrow, without discrimination. Lebanon is currently the country with the largest per-capita refugee population in the world, with Palestinian and Syrian refugees constituting one-quarter of its population. Education, especially quality higher education, plays a critical role in situations of forced displacement. Education offers the means for young refugees to equip themselves with the tools to become self-reliant and to build a meaningful future. The theme of this year’s report is IMPACT and I can certainly list myself as one who has been impacted by ULYP immeasurably. Every day, I have the opportunity to witness the real changes ULYP brings to the lives of the people we serve. Statements like, “ULYP made me understand that education is important for me,” and “because of ULYP, my dream to be at university has come true,” continuously motivate me to do better, confront what seems impossible and make it possible. Provides children, aged 4-6, equal access to a quality preschool program and prepares them to enroll in first grade on a solid foundation. Brings the skills of game development and coding to middle school girls, encouraging them to harness their technological capabilities and believe in their potential. Builds resilience of middle school students, and their parents, through English enhancement classes and extracurricular activities, thus opening doors for academic success and paving a path towards tertiary education. Supports middle school students at risk of dropping out through fun, interactive and student-centered English enhancement sessions, with the aim of improving their academic achievement and attitude towards education. Provides secondary students with English language and life skills lessons, as well as university preparation and counseling sessions, with the ultimate aim of supporting refugee youth enroll and excel in tertiary education. Matches capable students with scholarships at universities and helps them achieve their higher education aspirations. Also provides university preparatory courses, counseling, application guidance and university entrance exam training. Sustains the impact of programs by engaging the participants’ teachers, administrators and caregivers in workshops designed to offer the knowledge, tools and confidence needed to maintain and grow the impact of each project. Aims to develop parents’ understanding of their children’s cognitive, social and emotional development, and helps build a structure at home that embraces the change instigated during the program, by actively involving the parents as partners in their children’s educational journey. stage, discussions about the intended impact of each intervention are used to define the vision and set the strategy. At the level of implementation, we measure the extent to which we achieved our intended impact, and we use this as a gauge to evolve, in order to better serve our beneficiaries in the future. Reflection on the impact also guides us in drawing lessons and extracting best practices for improving current and future programs. IMPACT ON PRESCHOOLERS, AGES 4 – 6 The importance of the early years of learning is without debate. Poor educational provision during these formative years has been linked to lower academic performance, psychosocial concerns, reduced levels of health, and behavioral problems. Building a strong foundation for learning through early childhood education can reduce and address these challenges. The best gift one can give a child is the gift of learning how to learn. ULYP implements the HAPPY Program for this age group. education and children’s cognitive, social and emotional development. By building the skills of the teachers and parents in each community, HAPPY has a far reaching, snowball effect, indirectly impacting siblings at home and students at schools. Funded by United Palestinian Appeal, the Beit Jiddi Foundation, and generous donors who wish to remain anonymous. the gift of self-esteem and self-worth. ULYP implements three programs that cater to the specific needs of this age group, building the skills and knowledge necessary for success. Girls can Code Coding is the language of the future, yet, most coders in todayâ&#x20AC;&#x2122;s world are male. The value of learning how to code, and the need to address this gender imbalance, encouraged ULYP to design and offer a coding and computer science program to girls from marginalized Lebanese, Syrian and Palestinian communities. Starting in 2016, TLC has proven to be highly successful and has become one of ULYPâ&#x20AC;&#x2122;s core programs. In 2018, this program engaged, empowered and inspired 150 girls, ages 10-14, impacting their learning, social and emotional skills. Using Kano Kits, Scratch, Minecraft and other software, these students developed their understanding of computers and how to write the code for games, websites and more. Not only have these girls developed an important new skill, but they have been introduced to a new potential career path, strong female role models, and a space to discuss issues of gender and their academic futures. Supported by Theirworld. reinforced in the structure of the studentsâ&#x20AC;&#x2122; daily life, otherwise the newly acquired skills, and improvements in confidence, can be easily deconstructed. Therefore, in line with other ULYP initiatives, parent sessions for the SHARE mothers and fathers are part-and-parcel of the program. SHARE has been a core ULYP program for four years and continues to impact and transform young peopleâ&#x20AC;&#x2122;s education and motivation. SHARE alumni will soon be of age to enroll in our BRIDGE program. Supported by the Beit Jiddi Foundation. In 2018, the LIFE program engaged 70 students enrolled in the UNRWA Haifa school in Beirut, who were identified as â&#x20AC;&#x153;at risk of dropping outâ&#x20AC;?. At ULYP, we believe dropping out does not occur in a single moment, but builds up over years of negative educational experiences, low academic achievement, and a lack of motivation. LIFE aims to reverse this process and focuses on one of the main challenges the children face, that of failing in English and consequently all other subjects taught in English. The impact starts with reteaching and improving performance in English and, in parallel, rebuilding a positive attitude towards learning. Through customized, interactive, student-centered English lessons, as well as activities such as life-skills sessions, sports, art and drama, LIFE helps the children cross the bridge to retention and success at school. Sessions with the parents also ensure that a positive attitude towards education is being cultivated at home, as well as in school. In partnership with Taawon/Lebanon. include: low academic attainment, insufficient grasp of the English language needed to pass universities’ English entrance exams, a lack of understanding about university choices and the application process, and the affordability of tuition fees and associated costs. ULYP caters to these needs by implementing programs that strengthen their school performances and help them secure good grades, become more eligible for university education and begin their journey towards independent, successful adulthood. ULYP implements two programs for this age group. classes that prepare them for standardized tests such as the SAT and TOEFL exams. In year two, the students benefit from counseling and guidance sessions to explore university courses and career options. Students are also supported in filling out university applications and submitting these in a timely manner. Supported by Taawon/Lebanon and UNICEF. Change Starts with Education In 2018, ULYP launched the Change program to complement and expand the services it offers to youth aged 15-18. Change catered primarily to Syrian refugees enrolled in grade 12 and addressed their need to perform better in English and consequently in other subjects taught in English. 75 participants enrolled in this intensive program that prepared them for success in their school exams and university entrance exams, by providing university counselling and application support, and directing students towards scholarship opportunities. This cohort finished the program in the Summer of 2018 and over 80% of them are now at universities in Lebanon and abroad, proving that this short intervention had a long-term impact. Based on the success of the pilot program, and with the support of the Abdul Aziz Al Ghurair Refugee Education Fund, ULYP was able to continue offering the program. Change has now grown to serve 300 marginalized and refugee youth in three centers across Lebanon, starting with them in grade 11 and working with them for two years. These highly motivated students will complete the program in the summer of 2020. Change was launched and funded by The Asfari Foundation. Change 2018-2020 is funded by the Abdul Aziz Al Ghurair Refugee Education Fund. IMPACT ON YOUNG ADULTS, AGES 18 AND BEYOND At 18 years of age, concern for the future peaks, and with it comes the ambiguity and fear of the unknown. Attitudes and values that guide choices are intertwined with the reality of life and the options it offers. ULYP works to open doors to tertiary education opportunities; making the dream of higher level education and becoming a university student, a reality. ULYP Students and Graduates Around the World. Scholarships BRIDGE has an impact by providing equal opportunities to capable youth from marginalized and refugee communities living in Lebanon. Since its inception, BRIDGEâ&#x20AC;&#x2122;s second key component has been to work with students and match them with scholarships. In 2018, this component supported a new cohort of 113 students, enrolled in 4 universities in Lebanon and in 12 universities abroad. This brings the total number of BRIDGE students currently in universities to 467. 2018 also brought a new partner to BRIDGE; the Abdul Aziz Al Ghurair Refugee Education Fund, who joined ULYP to support the tertiary education of refugee students, and cost share their expenses until graduation. This fund also supports graduates as they pursue specialized vocational diplomas, directly connected to increasing their employability. Supported by various universities, foundations, governments and individual donors. As I look at you on this beautiful and emotion filled evening, I see in you the beautiful gems that each and every one of you is. I read on your faces the great potential progressively unfolding to shepherd our troubled world to the shores of peace, justice, and equality. I notice with delight, different smiles on your faces, but all exuding pride in and satisfaction with your achievements. Like many of you, as soon as I got my cap and gown off, the usual Mabrouk’s started hailing over me followed by the question: What’s next? And you sit there fumbled by it... Except for a few, the majority still don’t know what is coming next. We start worrying about it, and we go into the usual post-graduation depression of the unknown. I’d like to remind you here that 3-4 years ago, you were in the exact same spot. You didn’t know that you were getting a scholarship to some of the most prestigious universities in the region, and perhaps the world. But you did, and here you are celebrating it with such a loving atmosphere. SUSTAINING THE CHANGE Higher levels of education have been linked to a number of societal benefits: increased levels of income, lower levels of crime, and improved gender equality, to name a few. By providing access to quality education, ULYP is impacting refugee and marginalized children, youth and young adults to become more educated. However, the strength of this impact is limited without the support of the adults in these young peopleâ&#x20AC;&#x2122;s lives. ULYP believes in sustaining the impact, and therefore ensures that projects engage the teachers and parents of our students. Teachers working with the participants observe ULYP classes and activities and engage in workshops to expand their understanding of age-specific childhood education theory and share best teaching practices; taking away effective pedagogical practices and new ideas for their classrooms. UYLP projects also bring together the parents of our beneficiaries. These sessions are vital for parents to share their concerns and questions; discuss solutions and best practices; learn about their childâ&#x20AC;&#x2122;s cognitive, social and emotional development; and explore strategies for enhancing their parenting skills. By working with the adults who support our beneficiaries, we are ensuring that the impact of our activities is reinforced at school and in the home. We acknowledge the fact that these adults are the caregivers, educators and role models for many others in their community. This impact is therefore further disseminated, as these adults spread their knowledge and are better prepared to support all the young people in their care, now and in the future. OUR CAMPUS ULYP is one of the few active NGOs in Lebanon that offers marginalized and refugee children and youth access to a safe and warm space conducive to learning. The 24,000m2 ULYP campus, in the beautiful area of Dibbiyeh, houses two pre-school classrooms, a playground, three customized studios for IT, art and learning activities, a football field, a basketball court, a swimming pool, a central home for overnight programs, and a lot of outdoor green space. ULYP implements most of its programs on its campus to give the participants a break from their limited and crowded environments. This is every child’s right, and this access elevates marginalized and refugee children and youth to the same level as their peers from privileged or other communities. Thanks to support from the Jerusalem Fund for Education and Community Development, ULYP’s campus grew in 2018 in terms of safety and quality. The funded project, ‘Equal Access to Safe Play Space’, involved the refurbishment and enhancement of the preschool playground, which now includes padded flooring. Providing a well-equipped and safe area for our youngest learners maximizes the impact of their time on campus, helping bring ‘childhood back to children’. VOLUNTEERS The commitment and dedication of the ULYP volunteers are integral to the success of our activities. The kindness, care and commitment shown by our volunteers is inspiring. In 2018, we welcomed volunteers from 12 countries, all walks of life and each bringing their own expertise. Local volunteers include our Change and BRIDGE graduates and it is wonderful to see these young people giving back to the community. ULYP’s partnership with Duke Engage is also still going strong, with nine Duke University students having volunteered with the BRIDGE program and supported its University Preparation Course for eight weeks in 2018. All the ULYP volunteers are priceless; supporting the learning and growth of our beneficiaries, as well as helping us complete administrative tasks. ULYP is so grateful for this support.